Original Oil on Canvas 20" x 24" £795 and includes slip and gold frame. It rarely snows in St Andrews as it is so close to the North Sea. When it snows it is wet snow and tends not to stick, except when it comes from the east in February and freezes hard. 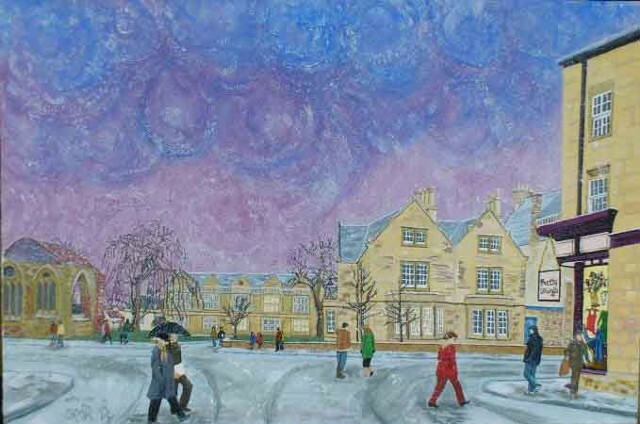 This painting portrays the wet snow of December as light fades and people are coming to the end of their working day. Despite the fresh snowfall the early sunset and pink sky are still visible through the swirling snowflakes.